Here is Sylvester the cat wearing reindeer antlers and a Santa hat. 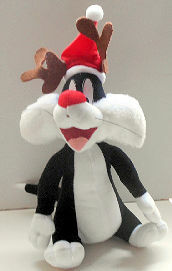 Sylvester is 11" high x 6 1/2" wide. Design copyright Warner Bros. 1997. Previously owned but in good condition.